Hello friends! How's it going? Can you believe that it's August already. What is going on?! That is so crazy to me. But regardless, it's time for some goal setting. I have been brainstorming and trying to come up with some awesome goals for this month that are unique to other months, which is why this post is a day late. Better late than never though! And don't you worry I didn't forget about the Happy Life series. I'm just pushing that back a day too. Doing what I have to do to create the best posts that I can! And with that being said, let's set some goals. Take less iPhone photos I've been doing this!! I still can improve a bit but I have been working on this a great amount and am so excited about it. It really inspires me to get out there and create even more. Do yoga every day I don't think it happened every day. But most days! I might have missed 2 or 3 days the whole month which I am quite pleased with! Read two books Ahh, this didn't happen. I am reading a book now though and do try to pick it up each day even if it's only for a few minutes. I'm getting back into this! Strength Train This kind of happened. I haven't had a set routine or idea of what to strength train. But I do find myself doing it once or twice a week whenever I feel like it which is much better than what it has previously been. Try 1 new vegan friendly restaurant Check! I went to Lili Cafe in Pittsburgh. It turned out to be a great experience! I left feeling so happy. I loved the vibe and the food was so reasonably priced and delicious. This is going to become one of my new favorites I believe! Overall I'm very pleased with July and my goals. I kept them in mind throughout the month and took the steps towards making things happen. Being conscious and aware of ways to improve your life is so important and rewarding whenever you look back upon the progress that you've made over a period of time. Manage Money I don't spend a lot of money on pointless things. I don't really keep track of what I spend either though. I have loans that I really want to pay off and I want to start budgeting each week so that I'm able to do that as soon as possible. I know that this goal will be a continuous goal for quite a while but I hope to get into the habit of managing money this month. Prepare snacks This is always a big deal for me. I end up at work with no snacks or grab some crazy thing that I don't even want to eat when the time comes. Each Sunday I want to make a snack of some type to be able to take to work each week. Making a large batch of something will help me save time and stress whenever it's Wednesday morning and I need to leave for work in 5 minutes but have no food. Job search I work at a retail store and have been there for a year this month. It's not something that I enjoy but the hours are great and my schedule is so flexible and I love that. It keeps me there. I am not happy with it though. I know I deserve better and I want to look into finding better. I'm manifesting finding a job that I enjoy with decent hours and decent pay. I don't particularly like children but for some reason I kind of want to nanny. It's strange. I don't know! But I do know that I am searching for a job that will better me as a person and allow me to leave each day feeling accomplished and motivated for the next day. Create a bucket list I have so many things that I want to do but they never happen either because I forget about them or because I just keep putting them off. Everything in my life is much easier accomplished whenever I have a list. So I want to create a proper bucket list filled with awesome things that I will accomplish. This is obviously another goal that I will have to work at for more than this month but I want to get in the habit of creating the list, checking things off if possible, and growing the list over time! That's it for this month! Let me know how it's going for you! 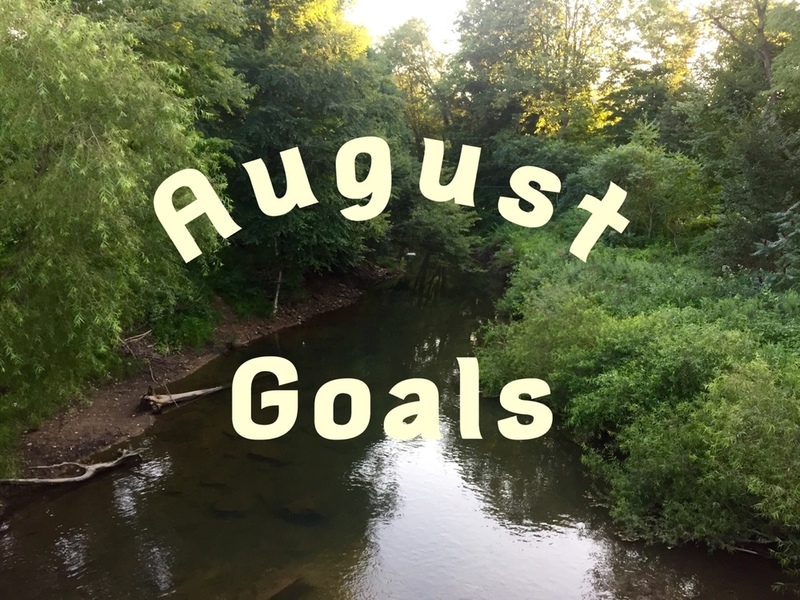 What are your goals for August? I'd love to hear! Comment below, email me, or share with me on Instagram!